Figure 1. Western blot analysis of ATF-2 fusion protein phosphorylated by different isoforms of p38 kinase, using ATF-2 (20F1) Rabbit mAb #9226 (upper panel) and Phospho-ATF-2 (Thr71) (11G2) Rabbit mAb #5112 (lower panel). Figure 2. 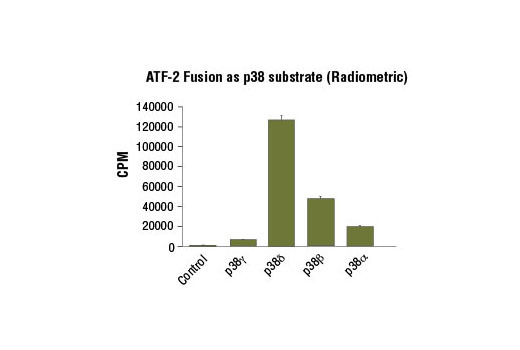 ATF-2 fusion protein was used as substrate to measure p38 kinases activity in a radiometric assay using the following reaction conditions: 25 mM Tris-HCl (pH7.5), 10 mM MgCl2, 5 mM b-glycerophosphate, 0.1 mM Na3VO4, 2 mM DTT, 50 μM ATP, Substrate: ATF-2 fusion protein 400 ng/μL, and p38 kinases: 100 ng/25 μL. Activating Transcription Factor 2 (ATF-2) Fusion Protein serves as a useful substrate for SAPK/JNK and p38 MAP kinases. It is expressed as a recombinant protein fusion containing ATF-2 residues 19-96. It contains the amino-terminal activation domain of ATF-2, which is regulated by phosphorylation of Thr69 and Thr71. 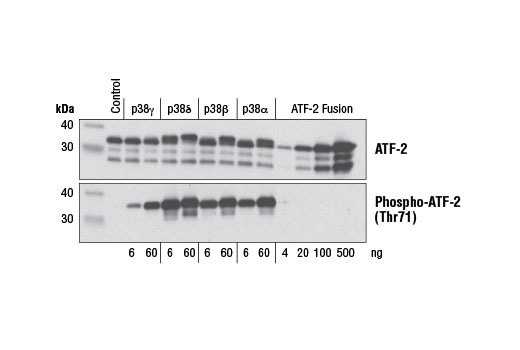 ATF-2 Fusion Protein, at a concentration of 2 µg/20 µl reaction, can be phosphorylated by an upstream kinase in an in vitro kinase assay with 1X Kinase Buffer (#9802) and 200 µM ATP (#9804). After a 30-minute assay at 30ºC, phosphorylation can be detected by Western blot with Phospho-ATF-2 (Thr71) Antibody (#9221).